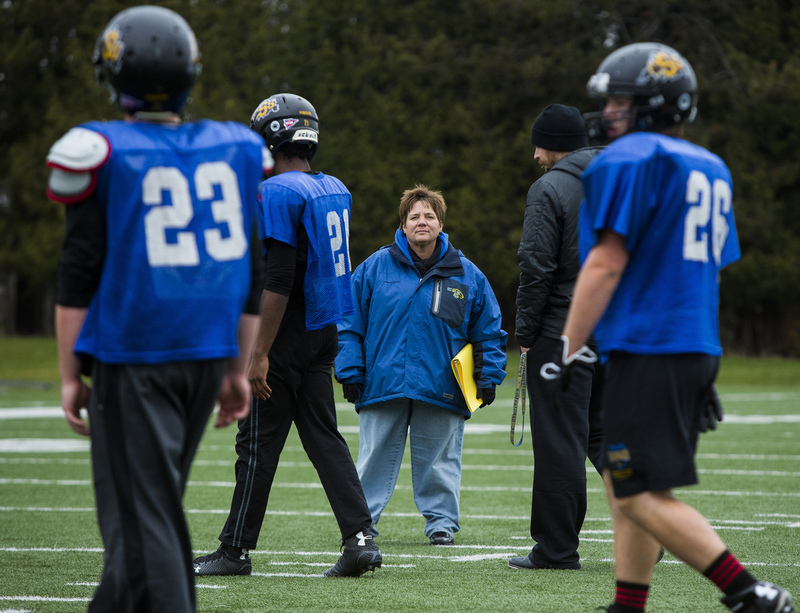 Sister Lisa Maurer, nun and kicking coach for the College of St. Scholastica football team, watches during drills in October. The tiny College of St. Scholastica plays Saturday in the first round of the NCAA Division III football playoffs. The upstart from Duluth, Minn., has only fielded a football team for eight years. But it has a secret weapon: a coach who might just be able to bring some divine intervention. At 5:10 p.m., the bell tower on the St. Scholastica campus calls 70 Benedictine nuns to prayer — all except Sister Lisa Maurer. She's busy at football practice. The 5-foot-2 Maurer is weaving in and out between players who tower over her, dispensing fist bumps, hugs and encouragement. "Is it cool that I'm coaching, of course it is!" Maurer says. "But in honesty, I look at it more as an extension of my ministry as a sister, that this is a way that I'm supporting our college at St. Scholastica. I'm not teaching in a classroom. I'm not doing our mission in the classroom. I just happen to be doing it on the football field." Ten years ago, Maurer was teaching at her high school alma mater in southern Minnesota. But she felt something missing. She knew she wanted to devote her life to God, but she figured that would mean giving up coaching. "I was OK with not being married, OK with not having my own children, but I was not OK with that idea that I wouldn't have that thrill of competition, and just that anticipation of game day," Maurer says. Still, she decided to trade one passion for another. In 2007 she joined the monastery at St. Scholastica, where the practice field goal posts were visible from her bedroom window. "I would find, in my afternoon, sneak out to football practice, maybe go for a walk, or say my rosary, or just sit in the stands, and watch the game, maybe read a book, just because I liked being around it," Maurer says. Then, last year, the college hired a new coach. 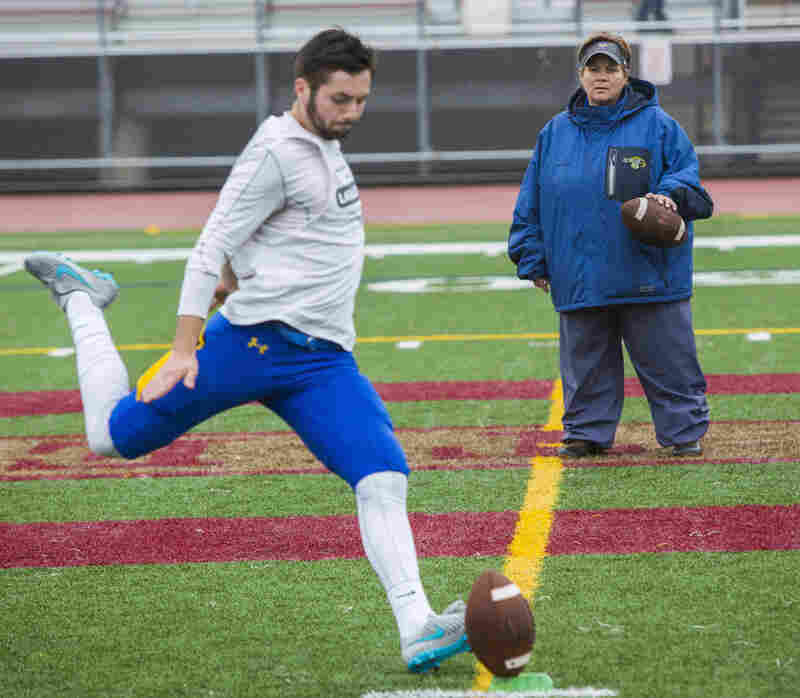 Kurt Ramler met Sister Lisa, and a few days later asked her to join his staff as a volunteer kicking and punting coach — even though she had never coached football before. "It was just wow, here's a passionate, intelligent person who wants to be involved in the program, how can I best utilize her energies and her skills," Ramler says. Maurer studied up on kicking and reached out to other coaches for advice. Ramler says despite a few raised eyebrows at first, the move has been seamless. "She's tremendous. She's able to wear her habit, go out there and yell at our guys when they're not toeing the line, and I just can take a step back, and go, I'm over here, being a figurehead, letting Sister Lisa do her thing," he says. Earlier this month, Sister Lisa welcomed freshman kicker Donovan Blatz off the field during the team's final home game. Blatz admits he was shocked to learn that a nun would be his position coach. But he and other players, like senior quarterback Mike Mensing, say she offers something other coaches don't. "Off the field, there's definitely the sister part of her job, so you can go to her with maybe a little bit more personal level than other coaches. She asks me how my family's doing, how my girlfriend's doing," Mensing says. "So it's nice to have a coach like that as well." Sister Lisa will lead the Saints football team in prayer Saturday morning, as she does every game day. She says she feels doubly blessed to be both a sister and a coach — and to be living out her mission on the football field.